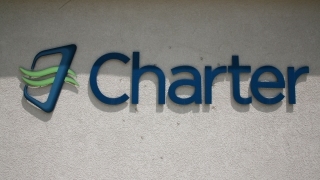 Charter Communications' logo is seen at their Newtown, Connecticut, location May 30, 2015. The U.S. Justice Department approved Charter Communications' proposed purchase of Time Warner Cable and Bright House networks on Monday, Reuters reports. The Justice Department valued the purchase of Time Warner Cable at $78 billion and Bright House at $10.4 billion. The deal must also be approved by the Federal Communications Commission. FCC Chairman Tom Wheeler will circulate an order on Monday seeking approval of the deal from the five-member commission with conditions, the Justice Department said.